Colorado Criminal Trial Law - Introducing Evidence Of A Defendant’s Good Character Under CRE 404 (a) - In Colorado Domestic Violence Cases - Denver Criminal Attorney Specializing in Domestic Violence Cases - Colorado Criminal Defense Lawyer. Colorado Criminal Trial Law – Introducing Evidence Of A Defendant’s Good Character Under CRE 404 (a) – In Colorado Domestic Violence Cases may be a critical step in persuading a jury of your innocence if you have been charged in Colorado with a domestic violation related crime. This article addresses an important provision under the Colorado Rules Of Evidence (CRE) 404 (a) – that permits your lawyer to introduce evidence of your character for peacefulness in any case but especially cases involving allegations of some type of assault. (3) Character of witness. Evidence of the character of a witness as provided in Rules 607, 608, and 13-90-101. As you can see from the rule – the general rule of no character evidence has TWO exceptions. One of the two exceptions is a specific allowance for evidence of the character of the accused. But there are two restrictions on the exceptions. The first of these limitations is that the defendant must go first before the State of Colorado. That is the DA may not introduce character evidence regarding the defendant unless and until the defendant introduces character evidence about himself or herself. The rule is clear. A defendant – with only a few exceptions (see 404 (b) is protected from the government’s use of negative character evidence. Therefore a defendant holds the key to the “locked door” of character evidence. The DA may not argue that a defendant is “a bad person” who probably committed the crime charged, but a defendant is allowed to argue that he is “a good person” who probably did not commit the crime charged. 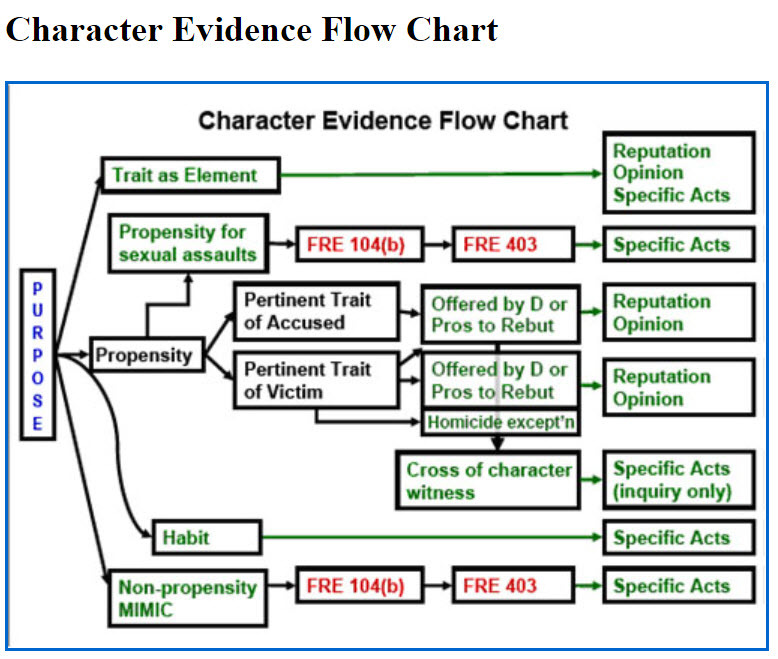 Here’s the rub – if a defendant put’s his good character into play – such as in an alleged false allegation of domestic violence by stating that he would not do such a thing, and the people who know him will tell you that… and then chooses to call witnesses to say exactly that, the defendant loses the protection of the character evidence prohibition. Once the door is unlocked – if there exists negative character evidence behind the unlocked doors and known to the State of Colorado, it also comes into evidence. Negative character evidence can be devastating.. The warning is this – know all there is to know about your client if you are the lawyer – and if you are the defendant – tell your lawyer all the bad as well as the good.. There is little room for surprises here. Character evidence must also take only one form at trial. It must be presented in the form of opinion or reputation testimony only and cannot be based on specific instances of conduct. The truth is – that is the best form there is. The testimony of character witnesses must be based upon personal opinion and knowledge of the defendant that he or she has a reputation for – say “peacefulness, is NOT a violent person” in an assault prosecution. In all cases in which evidence of character or a trait of character of a person is admissible, proof may be made by testimony as to reputation or by testimony in the form of an opinion. On cross-examination, inquiry is allowable into relevant specific instances of conduct. In cases in which character or a trait of character of a person is an essential element of a charge, claim, or defense, proof may also be made of specific instances of that person’s conduct. The good character evidence “tactic” in a Colorado criminal trial is not without its risks. After a witness testifies to positive evidence of good character, cross examination is permitted of course. Enter CRE Rule 405. The operation of CRE Rules 404 and 405 were designed to give the defendant the option of opening up the issue of his reputation. Let’s first restate the scenario. Under Rule 404(a)(1) a defendant has the option to bring in character evidence if he so desires this is a one way operation to an extent. That is the prosecution may not introduce character evidence solely to show a propensity to commit the crime. The state may not argue that a particular defendant is “a bad person” who probably committed the crime charged, but a defendant may make the argument that he is “a good person” who therefore probably did not commit the crime charged. BUT once a defendant has opened up the issue of his character with respect to some specific and relevant trait of character, the prosecution is now free to cross-examine the defendant’s reputation witnesses by asking about specific acts of bad character. In addition, the prosecution is now free to call its own witnesses to testify to the defendant’s bad character. AND, once again, a DA is that under the rules, the DA cannot bring in evidence of specific acts of bad character into evidence unless character is an essential element of a claim or defense. ABOUT THE AUTHOR: H. Michael Steinberg – Email The Author at – hmichaelsteinberg@colorado-domestic-violence-lawyer.com – A Denver Colorado Domestic Violence Criminal Defense Lawyer – or call his office at 303-627-7777 during business hours – or call his cell if you cannot wait and need his immediate assistance – 720-227-7777. If you are charged with A Colorado crime or you have questions about Introducing Evidence Of A Defendant’s Good Character Under CRE 404 (a) – In Colorado Domestic Violence Cases please call our office. The Law Offices of H. Michael Steinberg, in Denver, Colorado, provide criminal defense clients with effective, efficient, intelligent and strong legal advocacy. We can educate you and help you navigate the stressful and complex legal process related to your criminal defense issue. Colorado Defense Lawyer H. Michael Steinberg provides solid criminal defense for clients throughout the Front Range of Colorado – including the City and County courts of Adams County, Arapahoe County, City and County of Boulder, City and County of Broomfield, City and County of Denver, Douglas County, El Paso County – Colorado Springs, Gilpin County, Jefferson County, Larimer County, and Weld County,…. and all the other cities and counties of Colorado along the I-25 Corridor… on cases involving … Introducing Evidence Of A Defendant’s Good Character Under CRE 404 (a) – In Colorado Domestic Violence Cases. Introducing Evidence Of A Defendant’s Good Character Under CRE 404 (a) - In Colorado Domestic Violence Cases may be a critical step in persuading a jury of your innocence if you have been charged in Colorado with a domestic violation related crime.